One time leading QIPCO 2,000 Guineas hope Most Improved made up for a truncated start to his season when seeing off a big field to land the St James’s Palace Stakes. The Brian Meehan-trained colt had suffered a troubled run in the French Derby on his only previous start this season but had no such problems today. “He was doing some really good work over the winter - he had matured physically and was in great shape. Obviously, today we have been proven right,” said Meehan. “He is a lovely big horse with lots of scope but he has just been a little bit unlucky this spring. He got a little bit of bone pain going into his joints, which is pretty minor but it needs managing, and we got good advice and help. “He ran in the French Derby, when nothing went right, and Kieren (Fallon) was pretty upset with the race afterwards. We thought about running him in the Tercentenary Stakes and the owner called me and suggested we stick to this plan. He was in the race and it made sense. “We had so much confidence in him over the winter and it was just an upsetting spring with him but nothing serious. We knew we were dealing with a Group One horse and have all been patient. It’s a relief because we thought so much about him. Missing the Guineas was tough but I’ve never been much of a spring man. It was a superb ride as well, that was Kieren at his best. Kieren Fallon bagged his first British Group One since riding Yeats to victory in the 2006 Gold Cup, when Most Improved landed the St James’s Palace Stakes by three quarters of a length. The three-year-old had been the subject of bullish reports throughout the spring, but was forced to miss the QIPCO 2,000 Guineas due to injury and had no luck in running when finishing 10th in the Prix Du Jockey Club on his seasonal reappearance. Fallon said: "In the French Derby, he lost both his front shoes in the straight and I had to look after him after that. Brian (Meehan) has brought him here and the trainer has proved how good he could have been in the Guineas. That wasn't to be, but this has made up for it. "He is a lengthener rather than a quickener. I know that we went a nice gallop but I had faith in him - I have ridden him at home and know how good he is - and he proved it today. "He is a beautiful mover. I remember the first time Brian put me on him and you couldn't have ridden a better mover. He's got a great attitude and he proved it as a two-year-old when he was third in the Dewhurst. "I think that he is going to keep improving. This was a great race to win today and, if he improves on this, he will be hard to beat." French raider Hermival upheld QIPCO 2,000 Guineas form when finishing second in the Group One St James’s Palace Stakes. The Mikel Delzangles-trained colt finished third at Newmarket behind Camelot, and while only sixth to Power in the Irish 2,000 Guineas he showed he was better than that when chasing home Most Improved today. Hermival was three quarters of a length behind the winner and a head in front of third-placed Gregorian. Delzangles was absent, but joint owner Sheika Mohammed bin Khalifa Al Thani was represented by Alexandra Newman who works for his Al Shahania Stud. 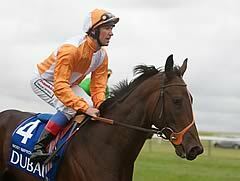 Newman said of Hermival: “In Ireland the ground was too fast - he’s a horse that needs cut in the ground. Here he showed the quality we know he has and proved at Newmarket. “We know he is improving, and having been third and then second here in Britain we hope that next time it’s a first place. He was young when he ran at Newmarket in the Guineas - it was only his third race and he lacked a bit of confidence and experience. He’s now maturing.